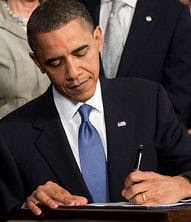 President Obama signs the Affordable Care Act. Medicare is quickly turning into a big issue for the 2012 elections. Democrats are charging that the Republicans are trying to “end Medicare as we know it.” For their part, Republicans are accusing Democrats of bankrupting the plan and using “death panels” of bureaucrats to ration costs. As always, the truth lies somewhere in the middle. Medicare primarily covers people over 65 or who have disabilities and, in Georgia, nine percent of the population is covered by Medicare according to the Kaiser Family Foundation. In 2012 health care, including Medicare and Medicaid, makes up twenty percent of Georgia’s budget according to the Georgia Budget and Policy Institute. The only budget sector larger than health care is education. As the population ages, there will be fewer younger workers paying the million dollar benefits of the retirees even as Medicare’s costs increase due to more seniors receiving benefits as Baby Boomers retire. This is clearly an unsustainable situation. As Cogan notes, it is made worse by the fact that Medicare recipients are paying a smaller share of their medical costs than in the past. This week, the Medicare trustees predicted that Medicare would be insolvent by 2024. That is considerably sooner than last year’s estimate of 2029, but better than the 2017 predicted a few years earlier. The 2010 report notes that the Affordable Care Act (“Obamacare”) reduced Medicare payment updates. In other words, the government is not going to adjust its payments to market rates. Medicare reimbursement rates are already so low and the paperwork so time consuming that many doctors no longer accept Medicare patients. This problem will be exacerbated in the future since the ACA cuts Medicare payment rates by 30% from its already low levels according to Medicare’s chief actuary. Eventually Medicare’s reimbursement rate will be one-third of what private insurance pays and only half of what Medicaid pays. The ACA also expands the roles of both Medicare and Medicaid, the sister program to Medicare that covers the poor. Medicaid is being opened to thousands of new enrollees while Medicare beneficiaries are being given expanded coverage, including the elimination of cost-sharing for preventive services and the so-called “doughnut hole.” Providing more coverage to thousands of new beneficiaries will clearly exert an upward pressure on the costs of the Medicare and Medicaid programs which together with the Children’s Health Insurance Program already account for 21% of the federal budget according to the Center on Budget and Policy Priorities. While the Democrats accuse Republicans of cutting Medicare, the Wall St. Journal reports that the Democrats have already made heavy cuts to the program. In addition to slowing payment updates, the ACA cut $4.95 trillion from Medicare over twenty years. There are additional cuts to the Medicare Advantage plan that allows seniors to choose a private health plan rather than the traditional government Medicare plan. The cuts in Medicare provided the basis for the Congressional Budget Office to claim that the new health care entitlement was revenue-neutral. Federal money was simply moved from one budget item to another to give the illusion of providing coverage at no cost. For their part, the Republicans preserved President Obama’s Medicare cuts when they drafted their 2012 federal budget. The Republicans use the cuts to extend the life of Medicare, however, rather than funding the ACA’s insurance subsidies. Paul Lindsay of the National Republican Congressional Committee said, "The fact is that Democrats robbed Medicare in order to pay for their massive government health care takeover which is a huge contrast to the House Republican plan to take that savings and use it to strengthen that program for today's seniors." 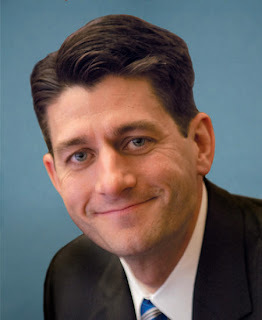 The GOP plan for solving the debt and deficit problem, not just Medicare, is the “Path to Prosperity” authored by Paul Ryan of Wisconsin. Ryan’s plan, which is modeled after the Federal Employee Health Benefits Program, would allow seniors to take the money that the government spends on Medicare and shop for whatever private plan they prefer. As described by CNN Money, the government would pay its share directly to the insurer and seniors would keep any left-over cash to use toward their out-of-pocket expenses. This provides an incentive for seniors to take ownership of their health care and look for the most cost-effective plan for their needs. When the plan takes effect in 2022, the government’s contribution would be indexed for inflation. The plan would also raise the retirement age to 67 by 2033 and limit benefits to the wealthy. The downside to Rep. Ryan’s plan is that the CBO projects that seniors would pay more for their health care under Ryan’s plan. In reality, having seniors pay more for their health care is probably unavoidable for two reasons. First, as already discussed, the government simply cannot afford to pay as much as it has. The numbers of Medicare enrollees would be increasing even without the influx expected under President Obama’s health care reform. Baby boomers are beginning to retire and their ranks will swell Medicare’s rolls. At the same time that the Medicare recipients are increasing, the number of workers paying into Medicare will be decreasing. More money going out and less money coming is not a sustainable situation. An obvious solution is to pay out less money by letting seniors pay more of their own health costs. The second reason is that if seniors are responsible for more of their own health costs then they are more likely to compare prices and shop around. This would help to introduce market forces into a sector of the economy that is currently subjected to government and insurance price controls. When a health care consumer only pays a flat copay for a health service, there is no incentive to choose a doctor that charges $100 over a doctor that charges $150. When consumers have to spend their own money, rather than that of the government, they tend to look for better deals. This exerts a downward pressure on prices that may ultimately help to control the rising cost of health care. Joseph Antos of the American Enterprise Institute says, “"The Obama plan is all about price controls. Ryan's is all about unleashing the market." The truth about Medicare is that the program as we know it is already gone. The Democrats have already made massive cuts to the program in order to fund new health insurance subsidies in their health care reform. They plan to enact more stringent price controls on doctors and hospitals in order to preserve coverage for seniors, even though this means that fewer doctors will accept Medicare patients. Price controls and fewer doctors will inevitably lead to shortages and possible rationing. The Republicans preserve the Democratic cuts in their 2012 budget, but rather than funding a new health care entitlement they propose to use the cuts in an attempt to extend Medicare’s solvency. Making Medicare solvent means having seniors pay more and the government pay less, but most Americans don’t realize this yet. A Kaiser Health Tracking Poll from April 2011 shows that 57% of Americans oppose cuts to Medicare. Only ten percent favor major changes to the entitlement program. A big part of the problem is that Americans don’t understand many of the terms used in the Medicare reform discussion. Only twelve percent know what premium support payments are while thirty percent understand how vouchers work. The Kaiser poll indicates that most voters oppose both premium support payments and spending caps, but opinions vary widely depending on how the question is posed. This means that public opinion on the issue is not firmly settled and the side that can better explain their position to voters can win the debate. The good news for Republicans is that the public seems to be leaning toward spending cuts. According to a May 2011 Rasmussen poll, 54 percent of voters believe that President Obama’s budget does not cut spending enough. Forty-seven percent favor mostly spending cuts while 39 percent favor an even balance between spending cuts and tax hikes. Only eleven percent favors tax hikes. According to the same poll, Ryan’s plan is favored by fewer people than President Obama’s (26-39 percent), but fewer people also oppose it than the Obama plan (34-50 percent). More good news for Republicans is that only twenty percent of the public is undecided about President Obama’s plan, but forty percent are not familiar enough with the Ryan plan to form an opinion. This means that almost half of the public is still open to the Republican idea of spending cuts. The most fundamental message that Republicans need to communicate is that major changes to Medicare are needed to preserve the program. If Americans do not understand that the program is going to run out of money in the near future, they won’t understand the need to enact changes.